Slavery is for the earth! It purports to show the changeover in world reserve currencies from one era to the next, which not coincidentally tracks the rise (and fall) of the various colonial empires of the last several hundred years, from the Portuguese to the Spanish to the Dutch to the French to the British to the current era of Pax Americana. The implication is obvious: No empire lasts forever, and sooner or later that empire will fall, and with it the world reserve status of its currency. 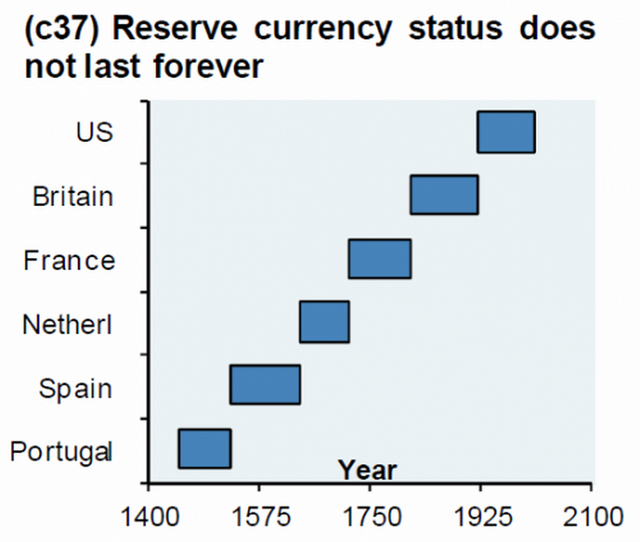 As Mike Maloney points out in a recent video, this chart is wrong “because the world didn’t have a reserve bank that was doing international settlements or acting as a hub of any type of monetary system until the Bank of England.” Prior to the Bank of England’s establishment (discussed in my documentary Century of Enslavement: The History of the Federal Reserve), there were predominant currencies, but nothing like a “reserve” currency. That being said, the point stands: Empires do rise and fall, and in the era of world reserve currencies and international settlements, their currency’s status as a world reserve falls with them. The other implication of this chart stands out like a sore thumb: The American Empire’s time is running out, and the dollar is going to go down with it. It’s a theme I’ve discussed many times on the podcast, and something I’ve written about in detail over the years. The dollar is dying; everyone knows that. But the world reserve currency does not simply vanish; it is replaced. So here’s the real question: If the dollar is going to go down, what will replace it? The answer to that question is not so straightforward as it might seem. In order to get a handle on that answer, let’s take a look at a few of the latest stories to pop up in the unfolding “death of the dollar” narrative. So why replace dollar reserves with gold holdings? This isn’t rocket science. Throughout much of the past several hundred years, the real reserve currency was gold. It is anyone’s guess what the next world reserve currency will look like, but one thing is for certain: it will either include gold as part of its backing or it will be tradable for gold at a rate that reflects gold’s current value. This is the reason that some of the biggest detractors of the dollar’s world reserve status—perhaps most notably Russia and China—have been hoarding gold like crazy in recent years. Oh, did I mention China? Yes, they have been hoarding gold and selling off US debt, too. And they have created the Shanghai Gold Exchange, which, as I’ve explained before, dovetails with the Shanghai Energy Exchange’s yuan-denominated oil benchmark to create the possibility of a “petroyuan” to rival the petrodollar. In short, the rise of the petroyuan makes it feasible for China to buy oil from its trading partners (like, say, Russia) directly with yuan, which that trading partner (like, say, Russia) could then convert to gold to move back home. Of course, it would be even easier if Russian banks and Chinese banks could facilitate direct exchanges between the two countries, settled in local currencies. And it would be ideal if all of this could bypass the SWIFT Network, which my readers will know has long been a tool of Uncle Sam’s foreign policy (and an increasingly unpopular one, at that). Now, as my long-term readers already know, these “alternatives” are a sham. Indeed, one of the first things CIPS did was sign a memorandum of understanding to use the SWIFT Network to transmit its information. That’s right, the SWIFT “alternative” actually relies on SWIFT to function! And as for SPFS . . . well, let’s just say it’s hardly ready for prime time yet, what with it’s 9 to 5 operating hours and prohibitively expensive wire transfer fees. So (surprise, surprise!) the BRICS “alternatives” to the existing bankster system are no threat whatsoever to the bankster establishment. But they do tell us something important: The infrastructure for bypassing the dollar itself is almost in place. Which leads us to yet another “death of the dollar” story from this week. This one, via Rothschild Reuters, tells us that unnamed “senior Saudi energy officials” have threatened “senior US energy officials” over a bill in the US Congress that would allow OPEC members to be sued in US court over price fixing. Since price fixing is basically OPEC’s raison d’être, and since OPEC is largely a Saudi operation, the Saudis are understandably upset by this. So what’s their threat? That they’ll stop pricing oil in dollars, of course. This is all part of a cat-and-mouse game between Uncle Sam and the Saudis that I’ve been documenting for years now, and this particular thrust and parry is no doubt just part of a larger story, but this story, too, tells us something important: The dollar is under threat from just about every angle now, and Washington’s frenemies (like Saudi Arabia) can smell the vulnerability. But it’s important to note a distinction here. The current bankster system does revolve around King Dollar. But the banksters’ vision of our globalist future does not revolve around the dollar. For those who haven’t listened to the full conversation yet, that “something else” that Wood is referring to is the idea of using blockchain and other “fintech” (financial technologies) to facilitate an entirely different type of world currency.